Slip resistant: grooved aluminum provides great traction for indoor and outdoor use. 32" and 36" Platform Width: provides excellent stability fitting all wheelchairs and power scooters. The ramps install instantly and attach effortlessly to any surface, including concrete, asphalt, wood, tile and marble. Anodized Aluminum is durable and lightweight. Non-skid surface for gription going up and down the ramp. This Rubber Threshold is ideal in both residential and commercial settings. We offer EZ-ACCESS's Self-Supporting Adjustable Threshold Ramp in two sizes. 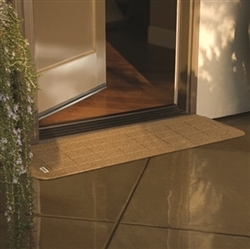 Ideal for indoor or outdoor use and provides a safe and smooth ground-to-sill transition. A Threshold Ramp is simple solution designed for smooth uneven doorways, sliding glass doors, and raised landings. Threshold ramps offer a high traction surface. Made out of aluminum or rubber, they fit 1" to 6" inche threshold heights.